Birmingham Horror Group organiser Steve Green was interviewed by BBC Radio WM presenter Mollie Green (no relation) about that evening’s guest appearance at the Two Towers Brewery by author Adam Nevill and plans for the first Birmingham FearFest in May. Many thanks to Chrissie Harper for extracting this audio file. 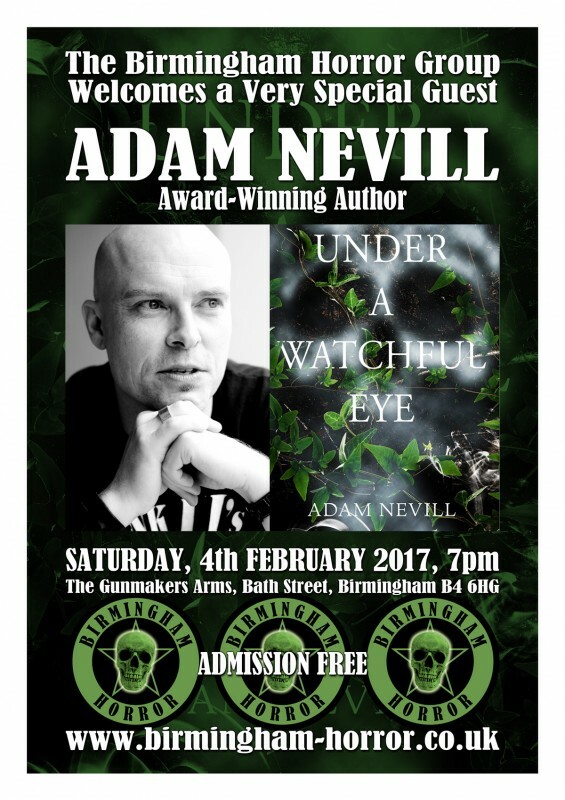 The Birmingham Horror Group’s special guest in February was best-selling Birmingham-born author Adam Nevill, who discussed his early influences, writing career, new novel Under a Watchful Eye and – announced just two days earlier – the forthcoming movie adaptation of his earlier work The Ritual. After the meeting, which was held in the adjoining Two Towers Brewery and filmed for coverage on regional station Made In Birmingham, many of the members moved back into the Gunmakers Arms to continue the conversation with Adam. Above (from left): Steve Green, Justin Langley, AmyLeanne Langley, Adam Nevill, Chrissie Harper, Ray Holloway. Birmingham Mail feature writer Graham Young pulled out all the stops on Friday to promote the Birmingham Horror Group’s first film event, following up a plug whilst guesting on Paul Franks’ BBC Radio WM show with an extensive article on the newspaper’s website. He wrote: “Horror fans are invited to enjoy a get together at one of Birmingham’s oldest pubs – where the star attractions will include ‘Cannibals and Carpet Fitters’. “Meeting kindred spirits at the ‘stake house’ could be the order of the day for genre film fans… as well as drinking real ales brewed on site by new owners Two Towers Brewery. “Running to five hours, the Mini-Movie Marathon organised by the Birmingham Horror Group will be held at the Grade II listed Gunmakers Arms on Bath Street. “The near 200-year-old pub was built in 1820, long before the advent of the movies, with or without gunfire sound effects. 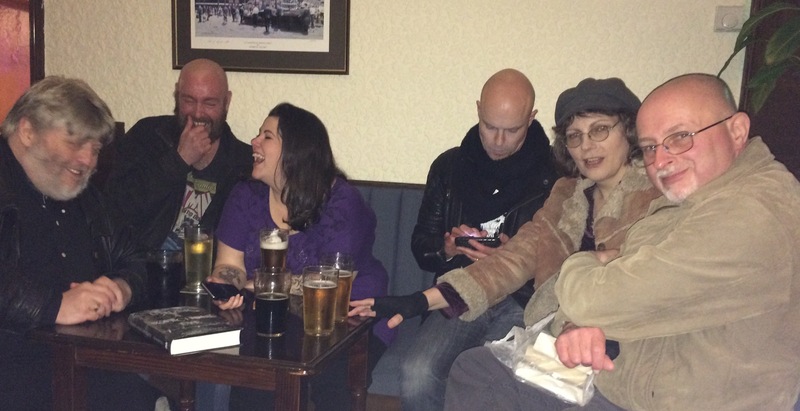 “Organiser Steve Green says: ‘The Birmingham Horror Group offers a relaxed forum for all fans of the genre to meet and discuss their favourite writers, artists and film-makers. “‘Are you interested in the dark fantasy fiction of such writers as MR James, Shirley Jackson and Stephen King? “‘Or perhaps the horror films of George Romero, Sam Raimi and Guillermo del Toro? From The Bride of Frankenstein to It Follows, The Haunting of Hill House to The Books of Blood, The Twilight Zone to Ash vs Evil Dead. “‘The films we’re showing aren’t all gore or splatter. The aim is to reflect the wide spectrum of the whole genre. “Perhaps fans will ask to see The Snarling featuring a cameo from former Midlands Today newsreader Ashley Blake… as a newsreader.